In our previous note, we had expressed caution with regard to the lowest value of VIX seen in recent times along with elevated levels of NIFTY PCR (Put to Call Ratio) and the possibility of the Markets seeing profit taking bouts from higher levels. In line with this analysis, the Wednesday’s session remained much volatile, especially in the second half. The benchmark index NIFTY50 saw 80-point swing before it ended with a net loss of 43.80 points or 0.41% after some pullback from the intraday lows. We approach expiry of the current derivative series and we expect the session to remain dominated with rollovers. We expect a modestly negative to flat start to the trade but there are high probabilities that we continue to see the Markets oscillating in a capped range with some volatility ingrained in it. 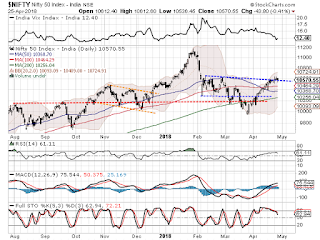 The levels of 10610 and 10650 will act as immediate resistance levels on the upper side. The supports come in at 10535 and 10480 zones. The Relative Strength Index – RSI on the Daily Chart is 61.1110. It continues to remain neutral showing no divergence against the price. The Daily MACD remains bullish while trading above its signal line but it is also seen narrowing its trajectory. Apart from a black body that occurred on Candles, no significant formations were observed. Pattern analysis now makes it evident that the NIFTY has fiercely resisted to the upper end of the rectangle pattern that it has formed. 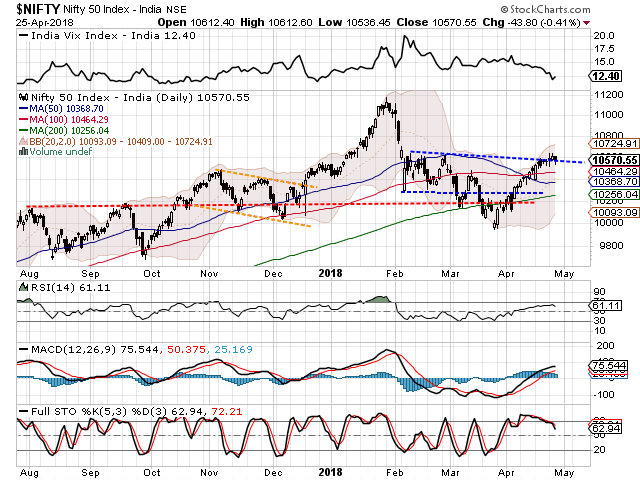 The levels of 10630-10650 have now become immediate resistance zone for the Markets. Overall, despite the fact that undercurrent in the Markets continue to remain buoyant, the zones of 10630-10650 have now become a immediate short term important resistance area for the Markets. For any fresh sustainable up move to resume, NIFTY will have to move past 10630-10650 zones and sustain above that. Unless this happens, we will continue to see the Markets remaining susceptible to range bound but volatile oscillations. We recommend remaining moderate on overall exposures and continue to adopt a very stock specific approach for the day. Short positions were seen being added on counters like ADANI POWER, HINDALCO, SUN PHARMA, AXIS BANK, STATE BANK OF INDIA, NATIONAL ALUMINUM, STEEL AUTHORITY, FEDERAL BANK, VEDANTA, CG POWER, NCC and ITC.